The Trulife Harmony Silk Triangle Plus Breast Form is lightweight and extra soft. This prosthesis is 35% lighter than traditional silicone breast forms. 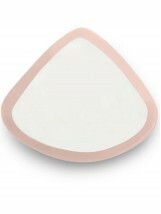 The Harmony Silk Triangle Plus features a silky-soft, matte skin for excellent feel. Comes with a removable cotton breast form cover.